Educational games and activity kits available on environmental topics. Great for schools, boy and girl scouts, churches and other groups. Resources are available for check-out for up to one week. You may also request a presentation from a Ramsey County health educator. 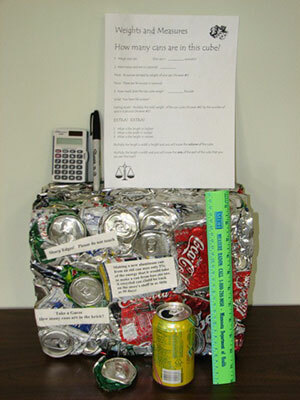 Using math and a little luck, figure out how many cans are in the can cube. 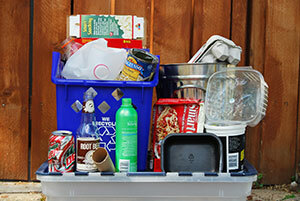 Learn how to sort common items in your home into the recycling, trash or organics recycling bin. This game can be played as a relay for groups that have a lot of energy! 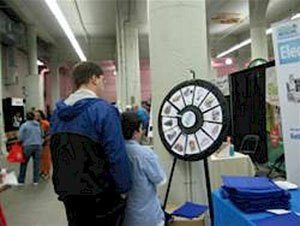 Contestants spin the wheel and answer a recycling trivia question. Questions are available in English, Spanish, Hmong or Somali. The prize wheel comes in a 3.5’ x 3’ x 0.5’ flat carrying case, and can be assembled to stand about 3.5’ high for table-top placement or 6.5’ high for floor display. Learn what can be recycled by helping to clean up a pond. Kids get to "catch" items and put them in the recycling or trash bin. This game requires assembly and a large space (minimum 10' x 10'). 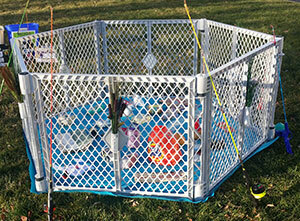 It includes 5 fishing poles and a blue mat to serve as water.